The entire line of 3D Solid Wood Panels for Walls, along with the rest of the American Wallscapes collection, is stocked in Outwater’s Arizona and New Jersey warehouse facilities. This allows us to provide faster and more cost-effective shipping to our customers. Our experienced sales staff is available to help customers find the product that works best for their projects. Please contact us for more information on our entire inventory of architectural products, as well as our sample programs for customers. Our unique line of Reclaimed Barn Wood Style Planks (Plank It Wallscapes) offers all the benefits and appeal of real wood at a fraction of the time, cost and labor required to install solid wood planks. These polyurethane planks provide the variation and warm character of authentic wood, complete with graining and knots. No two planks will look alike; these synthetic planks mimic the texture of real wood while offering complex color variation as well. When the different color finishes are mixed together, these peel and stick faux wood planks allow for a beautiful, large scale design piece right in your home. 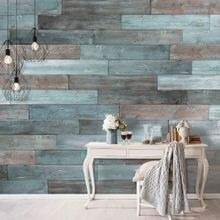 The entire collection of Reclaimed Barn Wood Style Planks, along with the other American Wallscapes lines, is stocked in Outwater’s Arizona and New Jersey warehouse facilities. This allows us to provide customers with faster and more cost-effective shipping. If you are finding it difficult to locate the product that best meets your needs, contact our experienced sales staff for more information on the Plank It Wallscapes collection, as well as our extensive inventory of products. These decorative wood wallscapes planks are an inexpensive way to spruce up walls, ceilings or doors and give your space a total makeover with a modern, rustic charm. The Wooden Wall Planks can be used to create a wood accent wall, and our wide selection of finishes can be mixed and matched to create a unique style or color scheme. The planks are stocked in 5-1/8” wide x 46-1/2” long x 3/16” thick size and are stocked in Outwater’s local New Jersey and Arizona warehouse facilities. We’re able to provide faster and more cost-effective shipping for all our customers, as well as access to our experienced sales department. If you are having trouble finding the American Wallscapes Wall Covering Planks and Panels line that best meets your design needs, contact our sales staff for more information on our entire collection of American Wallscapes, as well as the expansive inventory of architectural products that Outwater has to offer. 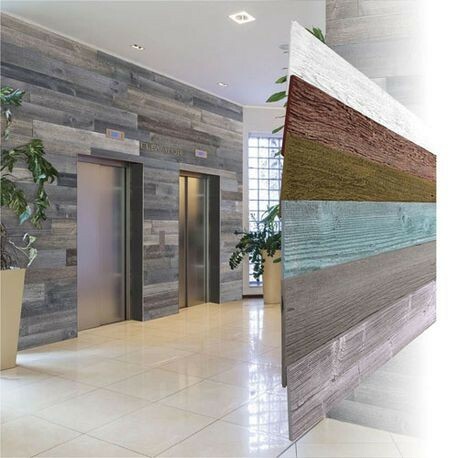 Outwater Industries’ beautiful line of American Wallscapes wall covering planks and panels can be used to easily create stunning accent walls with a modern, rustic twist and can assist you in changing the design or style of your space. We offer three wallscape styles which are the 3D Solid Wood Panels for Walls, Reclaimed Barn Wood Style Planks (Plank It Wallscapes) and the Wood Wall Planks (Wood Wallscapes). All three varieties of our American Wallscapes help to bring the natural beauty of wood into your residential or commercial space. These planks can be applied to walls, ceilings or doors, and the different colors can be mixed and matched to add depth and personal style to your interior. 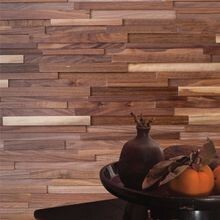 This collection of wallscape planks can also be immediately installed without sanding or painting. The American Wallscapes planks are all manufactured from durable, long-lasting materials and are available in a variety of different colors unique to each line of planks. 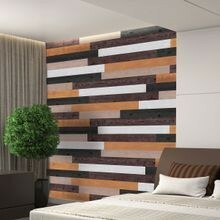 This line of wallscapes covering planks and panels is available in different box sizes depending on your needs. The entire collection is stocked in Outwater’s Arizona and New Jersey warehouse facilities so we can provide faster and more cost-effective shipping for our customers. If you are having trouble finding the product that best meets your needs, contact our knowledgeable sales staff for more information on the American Wallscapes collection, as well as our extensive inventory of products.